When in Manila, the top global hairdressing and beauty school, ACHDB , is now in Manila! And I was one of the lucky ones to experience its demo class in their Northeast Greenhills campus. Why? Because I felt it would be essential to know what is the “why” behind makeup artistry for my full-time job as a fashion and beauty writer. I wanted to learn beyond the usual youtube tutorials and the “no makeup” makeup look– and that is what the Australian College of Hair Design and Beauty does, it goes beyond your typical demo and short-lived workshops. 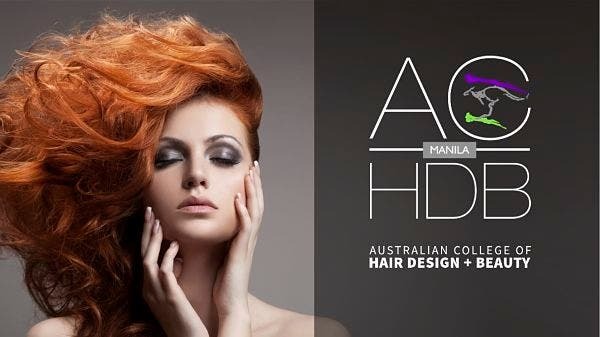 ACHDB, short for Australian College of Hair Design and Beauty, is an international makeup and hairdressing school. For starters, it is NOT a school for those who just want to “try thing things out” but for those who are aspiring to be professional makeup artists and hairdressers with an internationally recognized diploma. In short, it is a school for those who want to take makeup and hairdressing seriously, and for those who want to take on the international arena as their future workplace. To be honest, it got me thinking with the countless opportunities an international education offers. With the high demand for professional makeup artists and hairdressers in the fashion and beauty industry, the validation of an internationally recognized school would definitely take you to places. (literally and figuratively) Another question is…why the Philippines? Why open up a seemingly grandeur college (think: this is the “Enderun” of makeup and hairdressing education) in a third-world country? Well, the Philippines is the perfect venue for this kind of profession. There are countless salons with amazing talent–from those in your local neighborhood to your high-end hotels. The puzzling thing is that most of them don’t have proper education, experience is what got them there. Nothing is wrong with that. It all boils down to the fact there is a lot of potential with Filipinos who can become international makeup artists and hairdressers. So why not give them that kind of education? A glimpse on how lectures are done in ACHDB with head lecturer, Cecille Rebollos. The short lecture I experienced from ACHDB was an enlightening one. It was about the most creative part of your makeup, eyeshadow! Like I said earlier, no demos for this class (at least, this class). Since it’s a beginner’s class, it tackled more on how you should plan your eyeshadow makeup based on different factors. It wasn’t just about colors, it was also about the science behind makeup– in the structure of the eye, and how to achieve the ideal almond shape with the elements of basic contouring and highlighting. Lecture is just a small (yet very significant) part of the whole curriculum. A bigger percentage of the education goes to the actual practice of makeup artistry and hairdressing. There are classes that will teach you how to design and apply makeup for photography, bridal makeup, makeup effects, and even prosthetics. Since it is a makeup school everyone will have the same brand of makeup products to avoid varying qualities. Since you’re all using the same brands, the success factor is solely based on your skill to design and apply it. The best part is that your finished canvas won’t go to waste as it will be documented and kept for possible publication in the school’s own magazine–Glow, which automatically serves as the student’s portfolio. When he/she applies for a job, the student won’t be caught empty handed and will have a list of his/her published work ready for presentation. Click next to know more about ACHDB Manila! LOOK: This Royalty-Inspired ‘Wedding’ Photo Shoot With Kiray Celis Is Breathtaking!